We always welcome new patients to our practice. Please call us at 615.254.1393, or email us for new patient appointments. Our treatment coordinator will be happy to help you schedule. To make a payment on your account, simply indicate the amount you wish to pay below. This is our new custom payment page, so your old Patient Portal log in will not be used. However, your first payment will allow you to save your information with a new username and password. If you have any questions, feel free to give us a call! All major dental benefit plans accepted. 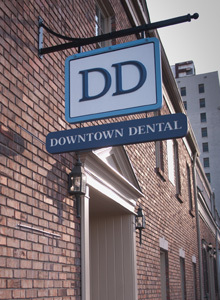 As a courtesy to our patients, Downtown Dental will file dental benefit claims for you. Please call us at 615.254.1393 in the event of a dental emergency. If your emergency is after hours, the recorded greeting will provide Dr. Clark’s direct number for you. CareCredit is a credit card used exclusively for healthcare needs such as dental treatment. Financing through CareCredit is often interest-free for balances paid within 12 months. CareCredit serves as a valuable and effective way to supplement your insurance or gain financial flexibility to meet your needs. You may apply online or a member of our staff will be happy to help you in our office.